Every year in January, the young lad takes part in a thing called Kangeiko. This Japanese term is roughly translated as ‘winter training’. He’s a member of the Hombu Dojo in Ranelagh, a professional, very friendly and expanding karate studio (he’s got a black belt – best not to mess him about). Anyway, Kangeiko involves 7 days of meeting at 7am, going for a short jog around the streets of the Ranelagh area and doing some karate training until 8am. On the last day there’s a party which, for young members, involves a cooked breakfast. Older members tend to carry on the party in a more traditional manner till later in the day. Parents can join in. I did it last year. It’s tiring, challenging and good fun. Anyway, this is only relevant because at 8am, I bring the young lad somewhere close by for breakfast and then drop him into school. 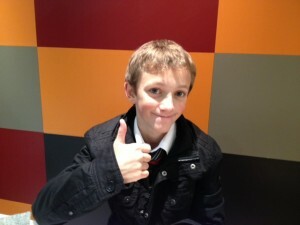 Sometimes we have breakfast in McDonalds. DON’T JUDGE ME. At least until you’ve tried it. There’s a fair choice, involving some combination of bacon, egg, sausage, muffins, rolls, porridge, pancakes and coffee/tea/milk/orange juice. Here’s the choice in glorious colour. Each item costs less than a fiver and, of course, they do meal deals. 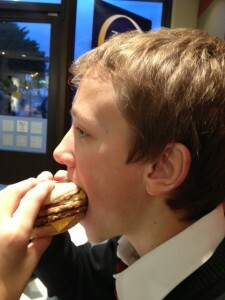 Today, the young lad opted for a Double Sausage and Egg McMuffin meal and I for the Double Bacon and Egg McMuffin meal. The ‘meal’ bit at the end involves a hash brown and a drink. Milk for him. Coffee for me. 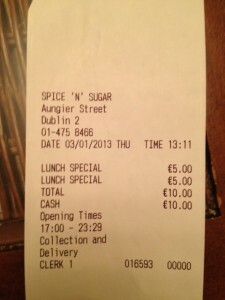 Each meal cost €4.95. The Double Sausage and Egg McMuffin (DSEMcM) is a glorious creation. Inside the 2 halves of the soft muffin are 1 egg (fashioned into a disc somehow), a slice of cheese (processed, obvs, and oddly square) and two sausage patties. These are the things that make this a sinful delight. They are juicy and sausage-y, but not like ordinary Irish pork sausages. I’m riffling through my taste memory as I type this … I’ve had sausages in Austria – ordinary sausages – for breakfast. They taste like them. I can’t be any more specific I’m afraid. I like them though. 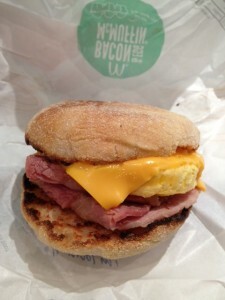 My Double Bacon and Egg McMuffin (DBEMcM) was pale in comparison. The egg and cheese were the same. The bacon was alright, slightly smoky in taste but nothing to dance about. 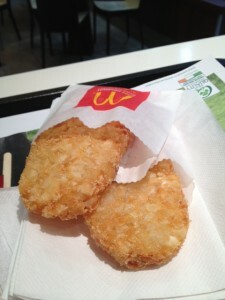 The hash browns which you’ve seen above are not very nice. They consist of grated ‘potato’, fashioned into a oblong disc and deep fried. They have no saving grace. They taste of nothing, except deep fry, and they leave a slightly bitter aftertaste in one’s mouth. The fresher they are, the less the aftertaste, but it’s still there. The milk and coffee were OK. 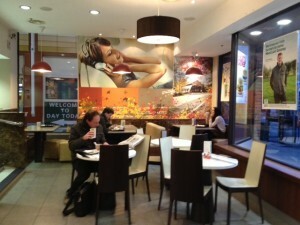 It probably doesn’t greatly matter but the McDonalds we were in was in Rathmines. It’s a 24 hour one and was quite busy this morning although quite a few people had left before I took this photo. I wouldn’t go there everyday and I wouldn’t advise you to eat a DSEMcM if you’re on a calorie controlled or low fat diet but sometimes you just have to eat stuff like this. By the way, you’ll be pleased to hear that, according to Hypestat.com, eatforafiver.com, as a site, is worth just over $11. I have to admit, today might not have ended well. You see, I cycled into town with the intention of eatingforafiver. In my post-Christmas/NewYear state of subcutaneous plenitude, I knew I didn’t want to eat noodles, anything battered and deep fried or anything reheated in oil. I didn’t really feel like cycling over to the North side of the city either, so my search was kind of limited to the South inner city area. On my way, I passed Buffalo 19 (see review here). It doesn’t open at lunchtime any more and there was no sign in the window about its previous €5 offers. I passed Ambala (see here). Its Masala Dosa now costs €5.50. I thought about the little place (Café Sophia) next to the big motorbike shop at the bottom of Wexford Street. It has some all-day breakfast offers for a fiver that I might try some other time but not today thanks. There was another place I passed, at the junction of Camden Street and Kevin Street, which used to be Fafie’s crepe place. It’s called something else now, something to do with goose or geese. It (still) does crepes but nothing that said ‘eat me’. Next stop, Clanbrassil Street. 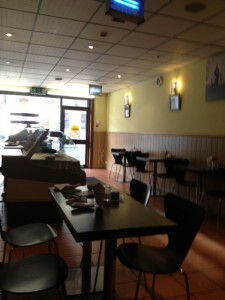 There’s an Asian restaurant there near Kebabish that specialises in Asian sweets. It also does non-sweet food and, driving past it recently, I thought I saw a fiver offer. It wasn’t open. It was now after two o’clock. 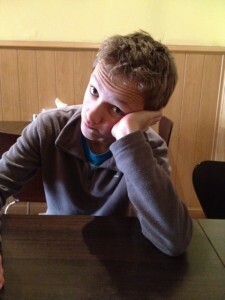 My hunger thing was very much on and I was descending into mild grumpiness. I cycled back to Camden Street. On a recent bus journey, I had seen what looked like a new place near Carvill’s off licence at the top of the street. 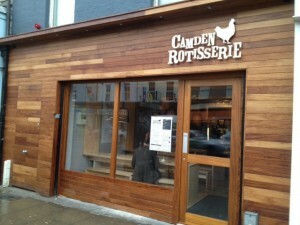 This is it – Camden Rotisserie. They have a Facebook page: here. 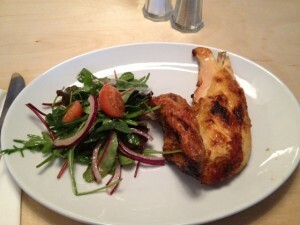 As you might guess, it specialises in chicken: roasted, not fried. And (yay!) it had something on the menu for under a fiver. Tick. 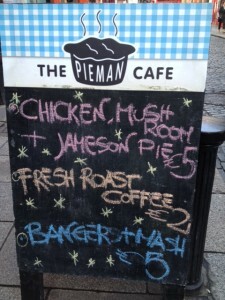 A quarter chicken for €4.25? OK. Feed me and we’ll ignore the strangely placed apostrophes (wings’s and side’s) for now. The decor is pleasant. Four long tables with benches either side. Bright but not harsh. A large blackboard on one wall (on which you are invited to draw your own chicken). Kitchen area at the far end. Service is friendly and attentive. There were eight diners including me there. All men, which was strange but probably coincidental (although you won’t see many women on their Facebook page either). But there’s nothing overly masculine about the place, so … well, I don’t know. Excuse the terrible photo. It actually looked a lot better than that in the flesh, so to speak. The salad/ garnish was unexpected but gorgeous. Baby leaves, red onion, cherry tomatoes with a nice, subtle balsamic-based dressing. Perfect, actually. And I don’t often say that about a garnish. The chicken was good. Very good. It was, as you can see, a wing and accompanying piece of breast-meat. The skin was crispy and barbecue-blackened in places which was good. And the chicken tasted of chicken, which is not always the case in restaurants. This was a very tasty lunchtime meal in a pleasant, clean restaurant, for €4.25. It ticked all the boxes. 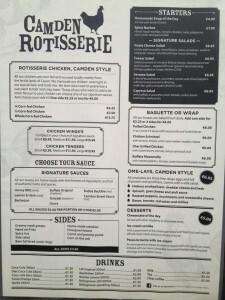 Camden Rotisserie is now firmly on my list for a further visit. It’s not a place for a long romantic dinner a deux but it is good value, it serves healthy food (I like the look of their omelettes too), it’s clean, it’s friendly and it’s on a street I like. I was put in a good mood by my eatforafiver experience today. So I was encouraged to be more observant on my way home about future eatforafiver venues. I spotted three: the Aussie BBQ on South Richmond Street (loads for a fiver or less), Burdocks in Rathmines (Monday and Tuesday specials for €5 and €4 respectively) and, if you are a school student (in uniform), the Jaffa Thai, opposite the Garda station in Rathmines, at certain times of the day. I was going to have a rant about the state of cycle lanes. But I won’t. I think a lot of people are put off the Temple Bar area by apocryphal stories of violence, licentiousness and anarchy. The only unpleasantness I’ve ever come across in Temple Bar has been that ‘comedian’ David McSavage doing some tired and lame routine that involved the public humiliation of some poor unfortunate passer-by. The place is a bit of a mess (especially Temple Bar Square) but I still enjoy wandering around it during the day, especially some of the streets leading from Dame Street, and its little nooks and crannies. And beyond Parliament Street, the area around Essex Street West has been newly developed and now has a theatrical interest with the brave redevelopment of Smock Alley Theatre. Temple Bar also houses the Elephant and Castle to which the spouse and I retain an emotional attachment from its early days. Anyway, today’s Temple Bar-related adventure was almost serendipitous. The young lad and I were heading for gyozas in Capel Street led on by the Irish Times suggesting at the weekend that a plate of them could be had for less than a fiver. We found, however, that they came in at €6.50. 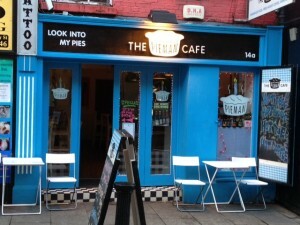 Undeterred, we headed across the river to a place I had spotted just before Christmas: The Pieman Café on Crown Alley, the street that leads from the back of the Central Bank to Temple Bar itself. From outside, it looks bright and interesting. Offers are displayed clearly on the window and the sign board on the pavement. Inside is inviting and comfortable, with interesting artworks, photos and postcards on the wall. It’s quite narrow but the restaurant seats about 22. It’s been there for just over a year and has a Facebook page: here. They offer a pie of the day and bangers and mash, each for a fiver. 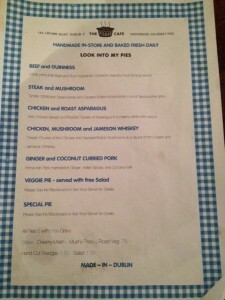 Otherwise, they have a selection of pies and one other non-pie main course for €6. You’ll also see some sides on the menu, some for less than €1, which I think is pretty impressive (having recently seen a bowl of basmati rice offered in Terenure for a shocking €5.50). 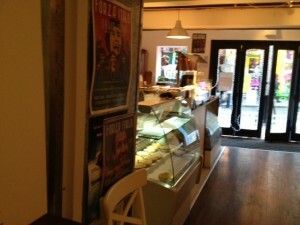 The guys behind the counter were friendly and enthusiastic about the place. 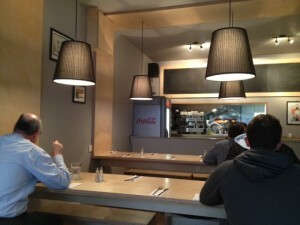 That really makes a big difference to the atmosphere of an eatery. We arrived early and the bangers and mash weren’t quite ready but we were immediately offered an alternative, for a fiver, without any fuss. Now that’s good and thoughtful service. The alternative, which I chose, was Boeuf Bourguignon with mash. The young lad opted for the Chicken and Mushroom pie. Nice big glasses of water were brought to us and the food arrived pretty quickly. We’ll start with the young lad’s pie. A lot of people don’t like pies and I’ve had some pretty poor ones myself, with thick tough pastry, soggy bottoms and insipid fillings. 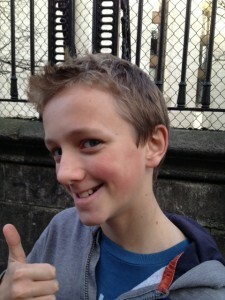 This pie, however, in the words of the young lad, was ‘awesome’. 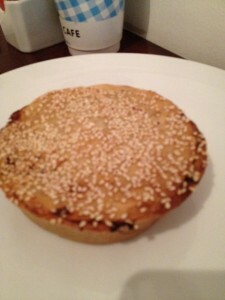 The pastry was thin and quite crispy, with sesame seeds on the top. 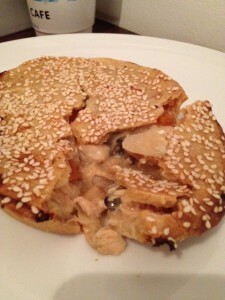 Inside was a piping hot rich-tasting filling comprising lots of chicken, mushrooms, onions and sauce. It was very good indeed and came in a quite manageable lunch-size portion. My Boeuf Bourguignon was delicious. Really delicious. 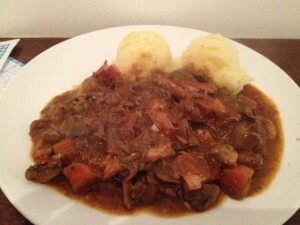 Bacon, beef, tiny mushrooms, onions, carrots and herbs in a rich wine-based sauce, with smooth mash. And plenty of it. Delightful altogether. We ate and left soon afterwards because we both had other places to be but it is the type of place where you could quite happily linger with a cup of coffee. This place is certainly worth a visit or five (they have a loyalty card). Don’t be put off if you’re not a pie person. That Boeuf Bourguignon was delicious and I’d say from looking at their Facebook page that their other non-pie offerings are pretty tasty too. If you are a pie person, then this is a place you need to try. OK. So the young lad and I headed into town to visit the Kylemore in the Stephen’s Green shopping centre where, I had heard (from the older lad [Happy Birthday Tom!] who had heard from a pal of his), that they did a 4 piece all-day breakfast for a fiver. And for no extra charge, there was a good view over St Stephen’s Green. DISAPPOINTED. It’s now €5.50. Thwarted but not dejected, the other options were a Balkan pie in Moore Street, a different type of pie in Crown Alley, gyozas in Capel Street or biryani in Aungier Street. Time and distance led us to the latter. I’ve walked and bused (did you know that ‘bussed’ means ‘kissed’?) past this place (Spice ‘n’ Sugar) a few times. It’s at the top of Aungier Street, close to DIT and the junction with Wexford Street, in a small parade of shops and cafés. Signs on the window advertise Chicken Biryani, Vegetarian Snack Box (with a free can of Coke) and a BBQ Chicken Roll, each for €4.99. … which is a pity. I can’t get a clear picture of who this place is trying to attract but, at lunchtime today, it wasn’t attracting anybody except us. It needs to be softer with a little gentle music maybe, a few candles, darker paint and so on. It’s just not very inviting. The bloke who took our order seemed a little distracted. He was later hammering numbers into a calculator with an air of increasing desperation so maybe that was the reason. But a smiley woman went off stage left with our order and we waited, with our free can of Coke. Our food arrived soon enough but not too soon, if you know what I mean. The young lad had ordered the biryani and I had ordered the vegetarian snack box (on a plate). 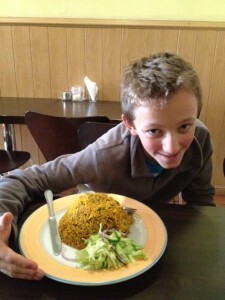 The biryani dish was substantial – a large upside-down bowl-shaped mound of rice and chicken, accompanied by some lettuce and red onion. The chicken was tender and the dish was nicely spiced with a moderate level of spicy heat. At a guess, it was flavoured by a commercial biryani masala rather than having been made from scratch. No matter. It was tasty. A little too oily for a biryani, but tasty nevertheless. And there was a lot of it. … consisted of two onion bhajis (coloured a vivid red), a vegetable samosa and a potato pakora, accompanied by some lettuce and a lot of red onion. The sign outside promised a chutney and some mint sauce but these never appeared. To be honest, I hadn’t noticed at that stage that they were supposed to be included, otherwise I would have asked. The bhajis were ok. A bit oily and certainly not freshly cooked, but tasty enough. 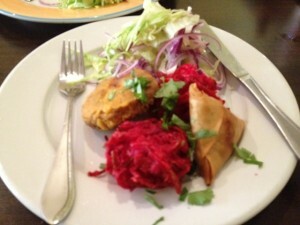 The pakora was nice and spicy and the samosa was OK too. I’d say, again, that these were commercially made products but at least they weren’t just stuck in the microwave for a couple of minutes. Together the dishes made a nice and substantial meal for two. If you were there alone, I’d definitely suggest that you go for the biryani. It was really puzzling to see the place so empty. Maybe it’s frequented by students from DIT in term time. I must check the next time I’m around the area. But, as I said, a little more effort on the owner’s part in relation to decor, lighting and general ambience could make a huge difference. 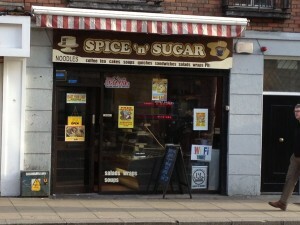 There are a lot of restaurants now on Aungier Street, catering for different tastes and budgets but Spice ‘n’ Sugar kind of falls geographically between those and the budget restaurants on Wexford Street. Wandering around town just before Christmas, I saw that three of my previous eatforafiver places have shuffled off: Taco Taco in the Epicurean Food Hall, Mangal Kebabs on Dame Street and the Chinese Buffet on Moore Street. Not surprised about any of them really although, of all of them, I’m sorry that Mangal Kebabs didn’t try a bit harder. 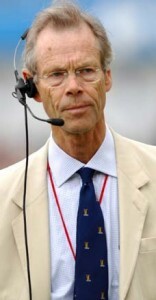 I don’t know whether any of you listen to cricket on BBC Radio 4. For me, it’s one of life’s pleasures and one of the last places in public broadcasting where there is an acceptance of some measure of eccentricity on the part of the commentators. One of the greats, to my mind, was Christopher Martin-Jenkins, who died on New Year’s Day and I’m very sorry about that. CMJ was distinctive, with his crisp diction, received pronunciation and broad vocabulary. When he described a ball bowled or a shot taken, you could see it in your head. And that’s what it’s all about. CMJ. RIP.